This post is dedicated to Mrs. Frances Love (1926-2010), a friend of the arts. 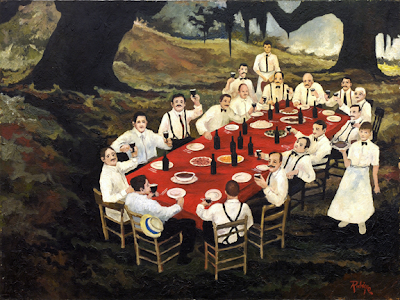 When George Rodrigue speaks of supporters during the early years of his career, three names always come up: Rita Davis, A. Hayes Town, and Frances Love. 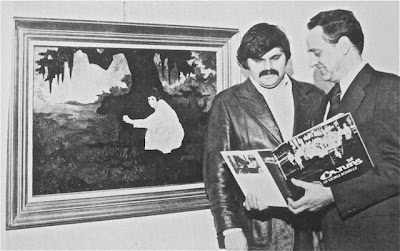 Between them they spent just a few hundred dollars on his canvases, however their influence in the community contributed greatly to George’s direction, reputation, and fame. Young George returned to his easel with this abstract concept shaping his method, and he never painted the same way again. Both Davis and Town purchased the resulting Rodrigue landscapes, now dark, seemingly antique, painted with care, and sparkling like jewels. (Pictured above, one of two 11x14 inch paintings purchased by Rita Davis in 1969 and later returned to George by her son, who requested that he “lighten them up.” George instead exchanged the paintings for a later work and retained the landscapes for his personal collection. My apologies for the terrible photo; however these canvases are nearly impossible to photograph. Also of note is the frame, an original molding finished years ago by George himself. For more see the post Painting to the Frame). 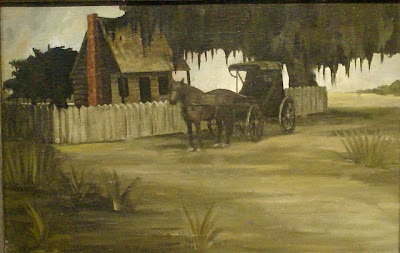 It was A. Hays Town who introduced George to the Reilly Gallery in New Orleans, the only gallery other than his own to ever display his work in Louisiana. An example from that show, pictured above and in the newspaper article below, remains in George's private collection. (For more info, see the post A Gallery of His Own). 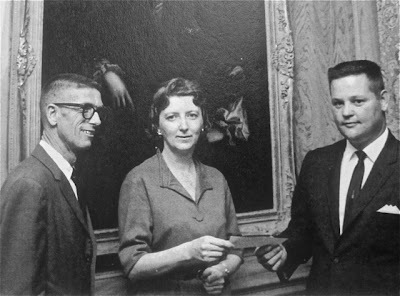 In 1969 George also met Frances Love, director of the permanent collection of the art museum for the University of Louisiana at Lafayette Foundation (then called the University of Southwest Louisiana) from 1965 to 1983. In 1968 Hays Town designed and built the art museum that would house the university’s collection of works, compiled from gifts to the USL Foundation for the Art Center for Southwestern Louisiana. 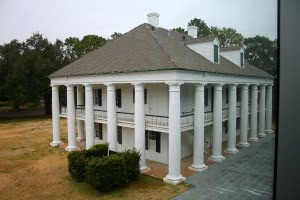 Modeled after Hermitage Plantation (1812) near Darrow, Louisiana, the impressive building stands today on St. Mary’s Boulevard in Lafayette, adjacent to the campus, and shares property with the Paul and Lulu Hilliard University Art Museum (2004). Although the new climate-controlled contemporary museum houses the art collection and rotating exhibits today, for years Town’s plantation-style ‘Pink Building’ (now painted white; photographed by Stephen B. Chambers) serviced the community as the Lafayette Museum. It was Frances Love who dedicated her efforts to this institution for nearly twenty years and who, after a long line of outside shows, chose 25-year old George Rodrigue as the first local (and living) artist to exhibit at the museum. The 1969 exhibition was hugely successful, and it was a milestone for George who could have no way of knowing that it was the last time the university's museum would devote their major galleries to his work. The museum and the university’s foundation together own more than twenty original Rodrigue canvases, largely donated due to the persuasive efforts of Mrs. Love and the generosity of local collectors such as Mr. and Mrs. Robert Shelton and Dr. and Mrs. John Straub. 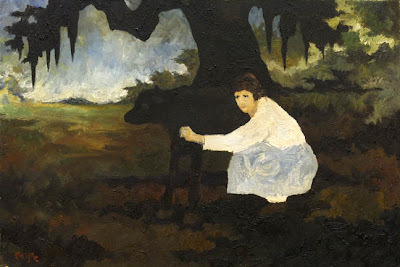 However, with the exception of a small exhibition in 2009, not since Mrs. Love’s retirement in 1983 has the art of George Rodrigue hung on the walls of the museum. “Mrs. Love brought new talent to the museum and got local people involved in the arts --- neither of which had ever been done before. She put on many shows, not necessarily dedicated to traditional painting and sculpture, but rather to things that attracted a wide audience. 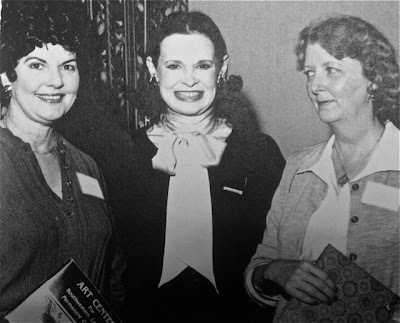 She was heavily involved in the Louisiana Gulf Coast Oil Exposition (LAGCOE) and geared museum exhibitions towards attracting its participants. She created a yearly design fair for exhibitions, bringing in artists, interior decorators, and fashion. She also produced periodicals and books about the museum and its collections and was instrumental in getting local participation for industries to support the university’s art programs. "Mrs. Love worked tirelessly for the arts, the university, and the community. She acted not only as the museum’s director, but also the lead public relations person in exposing the arts to Lafayette, something that had never been done before. "After my show in 1969, she became one of my closest, best supporters, and there’s no doubt that her devotion to my art established my strong early beginnings in and around Lafayette. Thank you, Wendy, for your kind words about my mother. My Dad was very pleased, as was I.
Hi John, I only met your mother once. It was at the Blue Dog Cafe maybe ten years ago, and we had a memorable visit. I recall her as gracious, knowledgeable, and passionate for the arts. George speaks of her fondly and often -- in interviews and lectures -- as an important influence on his career. We were saddened to hear of her passing. May your memories of your beautiful mother bring you and your family comfort. Thanks for including the photo of my uncle, Marvin DuBos, who was a noted artist himself in Lafayette -- and who arranged for me to meet George in 1980 while I was doing some investigative reporting in St. Landry Parish. 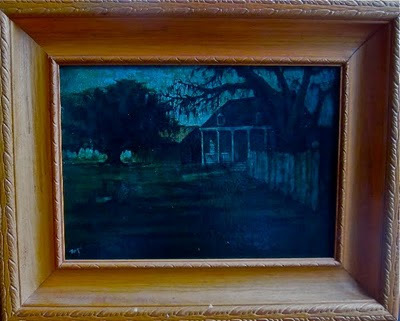 "Uncle Marvin" was always painting or sketching, and my parents have several of his works that they received as gifts over the years. I often stopped at his home on my way to or from St. Landry, and one day I asked about "the Cajun artist" whose book I had recently seen and whose work spoke to me in a deep and personal way. A few weeks later, thanks to Uncle Marvin, I worked up the courage to knock on George's door. One day you'll have to let him tell you the story of "the day George put the pool cue down" and taught me about art. Thanks again for another great post. Hi atullos- Marvin DuBos was the uncle of Clancy DuBos, a political correspondent at the time for the New Orleans Times-Picayune. He was an artist who enjoyed being involved in community projects. 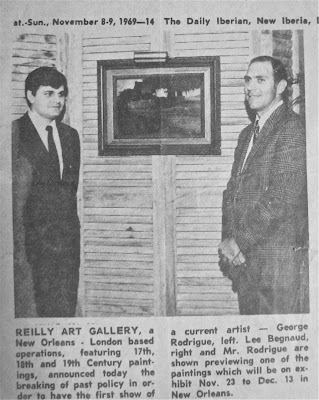 George Rodrigue and Marvin DuBos were friends. Sadly, he suffered from a terminal illness and passed away only a few years after they met.